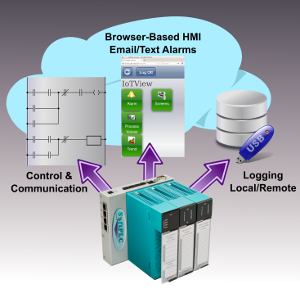 Written on Nov. 30, 2015 in SoftPLC Hardware/Software , SoftPLC Web Studio SCADA/HMIs . Last update on Nov. 30, 2015. Equip any SoftPLC CPU with a Web Studio Linux IoTView runtime and create an IoTPAC - a full-featured combination Programmable Automation Controller and SCADA platform. The new IoTView runs embedded in SoftPLC, communicating to the SoftPLC's data table via a RAM based driver. Add web browser based operator interface, sophisticated alarming, trending, and remote database access to any SoftPLC - including Micro's! Many applications don't require a touchscreen to be present and can benefit in using a Smart Phone/Tablet based web browser as the user interface device - save cost, space and maintenance of a fragile touchscreen in harsh environments.